Now there were 83 HM Inspectors to cover all mines in the UK. The Executive Council of the Derbyshire Miners Association met at Chesterfield on Saturday 21st January 1911. The President James Martin JP was in the chair. W Sewell Vice Chairman, James Haslam MP, William E Harvey MP, Frank Hall and Barnet Kenyon were also in attendance. Men at Holmewood and Williamthorpe obtained permission from their Union Lodge to give in their notices. There was to be a further interview with the Manager Mr Frederick Chambers with the object of arriving at a settlement. The dispute was over the men desiring that the riddles (forks or screens) be taken out and shovels used to load out the coal. A boy at Mapperley came before the Council. He had been out of work 14 weeks having been dismissed for breaking a pony’s jaw. The boy said that he did not injure the animal but that it suffered from an abscess. It was decided that if the boy was not reinstated the Council was to take legal proceedings. Outcome ? On 19th April 1911 there was a fire at Brookhill 16 ft (4. 88m) dia downcast shaft in the Waterloo inset pump house, and smoke traversed throughout the workings and came out at Pinxton No2 shaft. Many men were overcome through smoke inhalation and were rescued by the Pinxton Collieries Rescue team. At the time there were 411 men underground and 140 were brought out through the smoke, the others riding up the No3 shaft. The Pinxton colliery had a total of 8 shafts. S Stevenson was the Agent and there were 2 Managers and 6 Undermanagers for the complex. The Pinxton No3 Low Main seam workings ceased when headings from Brookhill were made to the reserves. The No3 shaft was kept open as a ventilation and emergency exit. The maximum manpower ever at Langton (Pinxton Collieries Ltd) reached 1,211 (235 in Deep Soft, 444 in Waterloo and 299 in Deep Hard). On 9th May 1911 a collier was burnt at Pleasley (Stanton Ironworks Co) when a waste fall caused gas to fire at a lighted candle. There was a small explosion at Swanwick (CRP Morewood) on 24th July and 2 men were injured. Both were using candles for illumination. 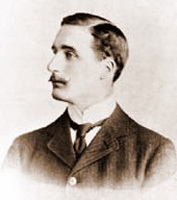 John E Whyatt was elected President of the Nottinghamshire Miners’ Association, John G Hancock was Agent and Charles Bunfield continued as Secretary with William Carter as Assistant Secretary and Lewis Spencer as Treasurer. In 1911 some pits owned by J and G Wells around Eckington were closed down due to abnormal places. At Clay Cross Henry Cator patented a safety device for arresting the fall of cages. New modern coke ovens were opened at Holmewood (North Derbyshire) (Hardwick Colliery Co) in 1911. These would be extended in 1917 due to demand for the product. The Sherwood Colliery Co of Mansfield Woodhouse purchased the Hucknall No1 and No2 collieries (Nottinghamshire) at Hucknall Torkard (Hucknall Colliery Co). 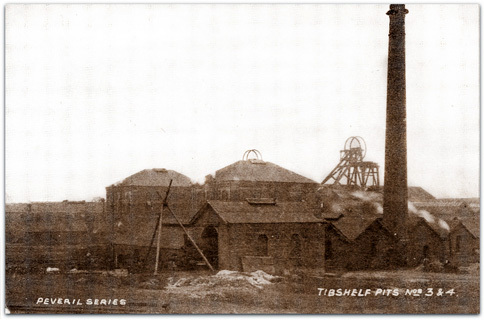 During 1911 the Top pit (Nos 3 and 4) and Bottom pits (Nos 1 and 2) at Tibshelf (Babbington Coal Co) were reorganised and administrated by one Manager. The manpower at New Hucknall (New Hucknall Colliery Co) (Nottinghamshire) reached 2,040 and similarly at Gedling (Digby Colliery Co), which had only opened in 1902. At Moor Green (Barber, Walker and Co) a maximum of 1,215 men was reached (516 in Deep Hard and 510 in Deep Soft). South Wingfield No1 and No2 (Derbyshire) (South Wingfield Colliery Co) was taken over by Wingfield Manor Colliery Co Ltd and the colliery was renamed Wingfield Manor colliery. There was a strike at Bentinck (Nottinghamshire) (New Hucknall Colliery Co) in 1911 over minimum rates. 1,739 men and boys were employed. There was a rail strike on 14th August. At High Park (Nottinghamshire) (Barber, Walker and Co) on 18th November there was an explosion and one man was injured. On the 22nd November 1911 there was a shaft accident at Southgate (Derbyshire) (Shire Oaks Colliery Co) when the descending cage hit the sump boards twice. Three men were killed and 9 others injured. 5th Jan 1911 Pleasley, Benjamin Charlton Glazebrook (19), coal loader. 6th Apr 1911 Creswell, William Ward (15), pony driver. 26th Apr 1911 Selston, Robert Smith (30), coal fall. 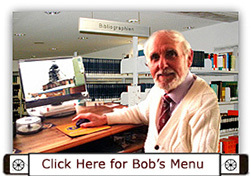 27th Apr Blackwell, John Bonsall (64), coal face. 9th May 1911 Pleasley, fall - gas fired at a candle, one man burnt. 14th Jun 1911 Morley Park, Richard Coote (41), shaftsman. 29th Sep 1911 Bolsover, Jermyn Lee (21), filler. 3rd Nov 1911 Warsop, William Fisher (26), gate end loader. 22nd Nov 1911 Southgate, (Derbyshire) (Shire Oaks Colliery Co) there was a shaft accident when the descending cage hit the sump boards twice. Three men were killed and 9 others injured. On 24th March 1911 a workman Frank Bodycote at Granville colliery, Swadlincote, (South Derbyshire) was killed and blown to pieces whilst opening some nitro-glycerine in the brick built surface powder magazine. Half a ton of dynamite exploded. Parts of the man were found about 100 yards away but pieces of bricks were found up to half a mile away. 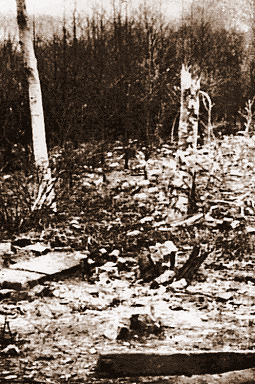 The photo shows the remains of the building. Bulwell (Nottinghamshire) (Babbington Collieries), Top Hard abandoned in March 1911. Surveyor: John T Walters. Managers To Be In Charge Of One Mine Only! The Coal Mines Act, 1911 brought in several improvements on the recommendations of the Royal Commission. The major points were that Managers could only have charge of one mine in future, unless agreed by an Inspector. There are many instances where one Manager continued to be in charge of 2 if not 3 mines, and a general rule of thumb was that the mine entrances had to be within 2 miles of one another. Under the Coal Mines Act there were 127 sections laid down. Surveyors and Mine Deputies were now required to have Certificates by examination by January 1913. Only competent persons to be employed as deputies, examiners and shotfirers, able to test for gas and measure quantity of air in an air current and make reports, besides having the requisite experience (Fireman’s Certificate). As with Managers and Undermanagers in the past, existing competent Surveyors were granted Service certificates, the necessary qualification for a Surveyor was issued in 1912. The examinations for Managers and Undermanagers were up rated. The Act required the number of men underground to be recorded – by the use of tallies or motties. All collieries had to have fully trained Rescue men. The Act also raised the age at which boys were allowed to work underground from 13 to 14. It was made compulsory for all pit shafts to have over-winding devices fitted and all new headgears in future were to be constructed of steel, the use of wood being banned. Inspectors were appointed for the welfare of horses and ponies for the first time – the ‘Pit Ponies Charter’. There was a total of 83 HM Inspectors now throughout the country. The drinking of intoxicating liquid was banned underground. Sleeping underground was also a criminal offence. Reg McKenna MP, Principal Secretary of State 1911-1914. Pollington, Deep Hard and Tupton, 298 and 63 surface, Undermanager E Lee. New Selston, Deep Soft, 476 and 74, Undermanager G Searston. Pye Hill, Deep Hard, Tupton and Silkstone, 362 and 106 surface, U/m Jas Haddon. Manager was Ben McLaren and Undermanager Gervase Searson. Sir Thomas William Barber is shown in the photo (right). 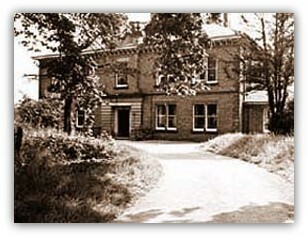 He was Managing Director for Barber Walker Co and Durban House, HQ of the company at Eastwood, Nottinghamshire. New Dunston (Mr ED Fawcett) to Deep Soft. Holly Head (JC Walch and Co Ltd), Mellor, opened, Two Shades seam, Manager JC Walch (no cert). Hill Side (T Wragg and Son), Swadlincote, (South Derbyshire), opened May 1911. A third new shaft at 20 feet (6. 1m) diameter called Low Moor and deepening of the North pit to the lower seams was commenced at Kirkby (Butterley Co). Bentinck re-opening out of the Low Main was commenced (New Hucknall Colliery Co). Rufford (Bolsover Colliery Co) began sinking, downcast shaft 21 feet (6. 4m) diameter and upcast 18 feet (5. 49m), English type tubbing, 14 sinkers / 163 on surface. Unstone Silkstone (Hawkins and Jackson), Blackshale. Welbeck (Nottinghamshire). The New Hucknall Colliery Co commenced sinking. A new mining village was created to the East of Church Warsop called Welbeck Colliery village, but now known as Meden Vale (photo below). Shipley Colliery (Derbyshire), Newcastle pit (Mundy) re-opened and a small portion worked under the pit hill during 1913-1914, water tapped by a borehole forward, in 1911, with flanking boreholes at app 22½º to each side to allow for any error. Hartington (Staveley Coal and Iron Co Ltd) re-opened, Blackshale and Silkstone, Manager T Richardson (821), Undermanager C Parker (357 / 2nd) and Campbell Pumping shaft, Manager W Bunting (839). Alliance, (South Derbyshire), Block and Little Woodfield finished 22/9/10, Surveyor George S Bragge. Bulwell (Babbington Collieries) Top Hard 307 yards (280. 75m) Surveyor John T Walters 24 Mar 1911, roadway through to Cinderhill and to Clowne seam, pillar left for Bulwell Hall. Cartwright (Granville Colliery Co), Swadlincote, Main and Stockings abandoned May 1911. Codnor Park No3 pit was closed by Butterley Co around this time. Far Lawn (Henry Gamble) Belper, Alton or Oughton or Belper Lawn batts 1’ 0” (0. 30m), bright coal 4’ 6” (1. 37m), batts 5” (0. 13m), unsaleable, 2 shafts 4’ 0” (1. 22m) diameter, 6½ and 8½ yards (6m and 8m), 15 May 1911, Alfred Fowkes Surveyor. 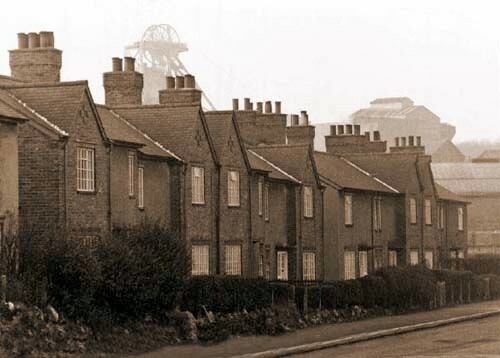 Ilkeston colliery, which was opened in 1874, was closed down (Ilkeston Colliery Co). Kilburn Hall (Parkin, Bell and Co), opened 1910. Tunnel 900 yards, (823m) at Jacksdale (Jas Oakes and Co) was closed, Deep Hard 125 and 48 surface men. New Dunston (ED Fawcett) 1 separate adit 1910 – Apr 1911, see other adit finished 1913. Walton and Riber (Hunloke and W Spooner), Chesterfield, Piper 31/5, Mr Harrison’s plan, 23 Nov 1911, total area leased 59 ac 3r 12p. Whaley Bridge (North West Derbyshire) (Buxton Lime Firms) Yard or Mountain seam, winding pit 127 yards (116m), 65 yards (59. 5m) to 18” coal, also pumping pit and balance pit, John Wesley Harvey also Kiln coal or Big Mine seam leased to Buxton Lime Co in 1876, 28 Jan 1911, Jno L Strain Surveyor. Whaley Bridge (Imperial Chemical Industries Ltd) Lime Division, Buxton, 16” or White Ash 1880, John Wesley Harvey 28 Jan 1911. Worthington (... ) (South Derbyshire) Stinkers seam, adit and 5 yards (4. 5m) deep air shaft, DC 17 yards (15. 5m), Oct 1911. Upper Lount 3’ 0½” (0. 93m) 4 May 1911, Nether Lount 5’ 6” (1. 68m) at 97 yards (88. 5m) 26 Nov 10, Roaster 3’ 2” (0. 97m) Sep 1910 – 26 Nov 1910, Surveyor Bartholomew L Wilson. Grassmoor (The Grassmoor Co Ltd) 1st Piper at 343 yards 1ft 10½in (315m) deep, finished 29 Dec 1911, Manager Thomas Denham Atkinson, Surveyor HW Needham. Ashgate (?) Blackshale No1 and No2 pits (start 1905) finished Mar 1911 but see 1915, change of ownership? Blackfordby (CF Hastings) (Leicestershire) sunk 140 feet (42. 6m) deep 1874, opened 1875. Moira Colliery Co (Lord Donington) 1887- 1897. Seams worked: Nether coal and clay 1875-1911 and Referee 1903-1911, and fireclay, abandoned Nov 1911. 1910: 6 u/g, 2 s/f. GA Lewis pre 1909 -1911. Daniel Bacon, then no manager after this date. Undermanager: Daniel Bacon (303 service) (1465 / 1st ) 1887- 1911. Herbert Humphrys, Chief Surveyor at Eastwood was appointed an Inspector of Mines and Ernest Harwood Clarke (1774) from Kent succeeded him, (later to become Keeper of Plans). From 1911-1917 subsidiaries of Bestwood Co Ltd were Askern Coal and Iron Co Ltd and Foraky. In 1911 there was the famous Howley Park case where the Railway Company forced the Colliery Company to leave a support pillar of coal 40 yards (37m) either side of the railway to protect their railway tunnel. The shafts were 226 yards (206. 6m) deep and the surface level was 290. 77 feet (88. 6m) above sea level. The Top Beeston seam was worked, coal 1’ 3” (0. 38m), coal and dirt 3½” (0. 09m), coal 6” (0. 15m), total extraction 2’ 0 ½” (0. 62m). Surveyor Robert B Bielby (cert no 72) of Fennell, Green and Bielby, and although in Yorkshire, position Longitude 1̊ 37’ 16” West, Latitude 53̊ 43’ 28” North, this case would have far reaching implications for all colliery companies in the future particularly in the Midlands Coalfields where there were many railway lines criss-crossing colliery takes. (see 1923).